Robyn: I'm Robyn Eckhardt and I am the author of Istanbul and Beyond. We support the diverse cuisines of Turkey, and this is my first cookbook. Suzy Chase: There's no such thing as a purely Istanbul dish, a native told you during a visit. I like you always thought that Turkish food was kabobs, chopped salads and baklava. How diverse are the cuisines of Turkey? Robyn: Oh, gosh. As diverse as you can imagine. When you travel from the Black Sea to the Mediterranean and from Istanbul all the way east to the Iranian and Iraqi borders and borders with Armenia and Georgia, you have got foods with Baltic influences and Russian influences and Persian influences and influences from the Lavant and in Istanbul you also have influences from the cuisines that were developed in Topkapi Palace. It's an incredibly diverse country. Suzy Chase: You spent 16 months in Turkey researching this cookbook. So what was the main criteria for the recipes? Robyn: The recipes that are in there are the result of the recipes that we found, I and the photographer David Hagerman, found during our travels. I collected about 200, over 200, maybe 225 recipes and developed those and tested them and the first criteria was that it had to be delicious. The second criteria was that I wanted it to be representative of the region that it was supposed to represent to include ingredients from that region, and the third criteria was that it had to be reproducible in an American kitchen. I'm not saying all of the recipes are super simple although some are very simple and very perfect for a weeknight quick dinner, but they had to be something that a cook could do, and I wanted a range of recipes from the very simple to maybe more complicated or time consuming sort of project recipes. There's really something in the book for everyone I think. Suzy Chase: Is it true that these recipes have never been published in English? Robyn: Some of them have never been published in English simply because food writers in Turkey and outside of Turkey tend not to pay attention much to some of the regions that we included, so there are for instance some recipes from mostly Kurdish parts of Turkey that I haven't seen in English. It's hard to say they've never been published in English but searching the internet and looking at other cookbooks that have been published on Turkish food, I don't find them. Suzy Chase: Describe some of your favorite culinary regions. Robyn: The Black Sea. I love fish and I love seafood and fish and anchovies in particular are really a religion on the Black Sea. When it's anchovy season which is the winter locals are eating these fish which Turks call the prince of fishes two and even three times a day. They're dipped in corn meal and fried in a pan. They're made into breads. They're baked and they're stewed, and this region also has a lot of leafy greens in the diet, so Swiss chard, greens that are very much like collard greens. It's a very vegetarian or vegetarian friendly cuisine and I also love the cuisine of Hatay Province which is in the Mediterranean and borders Syria. It's sort of what closer to what we might know as Middle Eastern food, so you've got humus and baba ganoush and you have flat breads covered in spicy cheese and just, it's a very kind of vibrant, olive oil based, pomegranate molasses rich cuisine with a lot of chilis and I love chilis. So, I would have to say those are my two favorite culinary regions. Suzy Chase: It's interesting that the Hatay Province is true meze culture and I thought all of Turkey as a whole a meze culture. Robyn: No, because meze are something that you have with drinks and when you move sort of away from Istanbul, there's less of a drinking culture. Families eat together and they don't go out to meyhane which are these drinking houses that you find in Istanbul where you can wile away a whole night eating meze and drinking raki or maybe beer. So, without that drinking culture you don't have a meze culture, but in Hatay which used to be part of Syria there is a large Arab Christian population and of course, Syria and the Levant has this meze culture and so that's why you find it there. It's just a much more, there's more drinking there and the meze culture really comes from the proximity to the Levant. Suzy Chase: Now, what's pomegranate molasses? I've never heard of that before. Robyn: It is an amazing condiment that every person should have in their pantry certainly. It's basically at its purest and this is what you should look for if you're going to buy pomegranate molasses, pomegranate molasses is nothing more than the pomegranate juice boiled and boiled for hours until it's reduced to a syrup. It's got a tartness and it's also got this wonderful citrusy flavor so I couldn't say oranges or lemons but it's not just sour. It's got layers of fruit and tartness that just work beautifully in salads like in a salad dressing and in a stew or in a sauce, a cooked sauce, and I know people who just use it to even roast potatoes. They'll toss potatoes with olive oil and pomegranate molasses and throw those potatoes in the oven. I think if you try pomegranate molasses you will find ways to use it in the kitchen because it's so delicious. Suzy Chase: Why do you think lamb and mutton are only eaten in the city? Robyn: The thing about lamb and mutton is that most people tend to think that Turks eat a lot of lamb. People in Turkey eat a lot of lamb, but sort of what I'm trying to, the story I'm trying to tell in this book is that diets are shaped by the landscape and the climate in which people live, so if it's a region that does not support the grazing of lamb, the raising of sheep, then it's a region that tends to have fewer people who eat mutton. So on the Black Sea it's a mostly fish based diet. People say they don't even like the smell of lamb, and they'll only have lamb in the springtime when they can get very, very young and mild and less gamey lamb, where if you go further east to the Iraqi/Iranian border in Van and Hakkari there is mostly lamb in the diet because the landscape is very rocky and mountainous and it's only lamb, it's only sheep and goats that can traverse and pasture in those regions. Suzy Chase: Speaking of landscape, the photography in this book is beautiful and it really transports the reader to Turkey. Suzy Chase: Tell us about your photographer Dave Hagerman. Robyn: David Hagerman is an American photographer. He also happens to be my husband. Robyn: And co-publishes our blog Eating Asia with me, and we've worked a lot together on editorial for New York Times and some of our other publications. We traveled together for the entire course of research for this cookbook and sort of sometimes working together, sometimes working separately, he would take off, photographers keep crazy hours. They have to be out at first light, so he'd be out of the hotel room or the home where we were staying at five am, driving, looking for landscapes, looking for scenes, looking for ways to capture the foods of the regions we were in, and it was a truly collaborative project and I feel very lucky to have him, his photographs illustrating the book. I think it really brings the whole thing home. Suzy Chase: Was it difficult in conservative eastern Turkey to take photos? Robyn: Women tend not to want their faces photographed. If they don't mind being photographed, we had people who would say to us, women mostly, I don't want to see that photo on the internet or I don't want to see that photo. Please don't put it somewhere where the public could see it, and of course we respected those wishes, but in general people don't mind being photographed. They especially love it when you photograph their food. The process of making food or producing ingredients, I think a lot of times people were very puzzled. Why are you photographing this making of pomegranate molasses or why are you photographing this woman milking her goat. It's just daily life to them. So they couldn't quite figure out why we're so interested, but then you'd explain we're working on a book or we're documenting food culture, and it'd kind of be like oh, that's really interesting. We didn't have any problem really at all photographing out east. Suzy Chase: Talk a little bit about the worker canteens. Now, are these what they call esnafs? Robyn: Yes. Esnaf means a worker or tradesman. They started out really in Istanbul in the 1800s when office work became a thing in the European side of Istanbul. People needed, men because women were still in the home at that time, needed a place to eat lunch. They couldn't get home for lunch and they needed somewhere to eat, and these very casual, very homey places opened up that would serve home style dishes. If you go into these places everything's on a steam table and I think that tends to put foreign visitors off. They poke their head in and they see a steam table and they think ooh, buffet, but the dishes they're serving are dishes that would be long cooked or stewed and if they weren't sitting on a steam table in this lokanta working men's canteen, then they would be sitting at the back of a grandma's stove or at the back of a mother's stove, so these are actually really dishes that are perfect for the steam table because you like a stew that's sort of been sitting over low heat for a long time reducing and getting richer in flavor, and these are very economical places to eat. They're also in eastern Turkey where I came across a lot of dishes that I really loved, and it's basically the homiest of home foods served in a public place. Suzy Chase: Did you have a favorite dish at these canteens? Suzy Chase: All of them? Robyn: You can always, almost always find kuru fasulye which are white beans stewed for a long time in tomato sauce and there's a recipe for that in the Istanbul chapter. I think for me that's an iconic esnaf lokanta dish. It's just, it's homey. It's comforting. I mean, who doesn't like soft white beans and they're often served, it can be served and is often eaten over a buttery rice pilaf that might be studded with maybe some orzo or some almonds. It's just a wonderful dish that's good especially in the winter. Suzy Chase: So your blog is called Eating Asia, and there's one blog post called Please Don't Call it Turkish Pizza. Talk a bit about the desire to make familiar unfamiliar foods. Robyn: I understand that, and I think especially if you are a restaurant owner, you're a Turkish restaurant owner in the United States maybe, and you're trying to, you want to introduce new foods and you want people to somehow be able to identify with them, so you have this dish called lachmagine which is flat breads with lamb paste over it. It's delicious, and if you just put lachmagine on the menu and you say it's a flat bread with lamb paste, customers might be like hm, but if you say it's Turkish pizza then people are like yes, I get it. Okay, I get what pizza is. I'm going to take the leap. But I think at this point, we have had Turkish food in America long enough that we can start maybe trying to use a few words to say what the dish really is. I mean, we use the word kabobs and that's what a kabob is called in Turkey. It's a kabob. We use the word doner. We use the words baklava, so let's just go there and call it lachmagine is what I'm trying to say. And it's not pizza. It's a very Turkish Middle Eastern dish. It's not pizza. Suzy Chase: It's not pizza. Robyn: It's not a pizza. It's a flat bread. Suzy Chase: So the other night, I made your recipe for slow cooked beef and vegetables on page 152. Robyn: I saw that on Instagram. It was a beautiful photo. Suzy Chase: Yes. So, this dish was in the oven at 450 degrees for three and a half hours uncovered, and I was shocked by how moist and tender the meat was. Robyn: And it was easy, too, right? Suzy Chase: It was so easy, but I thought this thing's going to be dry. It's going to come out dry, but it wasn't. The meat, you didn't even need a knife. Suzy Chase: The meat was so moist and flaky. It was perfect. Robyn: It's just a, it's a really great dish to make when you just, you're going to be around the house but you just don't want to deal with anything. You whack it in the oven and three and a half hours later you've got this beautiful stew, and it's a dish that is endlessly adaptable. It's versatile, so you could make that dish without meat and maybe put some legumes like chickpeas in there or you could make it with lamb. You can change the vegetables according to season. It's a dish called givetch which is also the name of the clay dish that it's usually cooked in, and this is a dish that's made in wood fired ovens. People will take their givetch to the wood fired oven bakery, bread bakery and have the baker bake it for them, and that's why the heat, I set the heat so high is I'm trying to recreate that intense heat of a wood fired oven that this dish slowly, slowly cooks in to produce that gorgeous tender slightly browned result. Robyn: I'm on Twitter at eatingasia. I'm on Instagram at instanbulandbeyond where I've been posting exclusively photos from the research of the book, photos from the book and photos related to the book, and you can also find the photographer Dave Hagerman on Instagram. I have to say all of the photos on my Instagram are by him. I don't even know how to use a camera. Suzy Chase: They're stunning. You don't need to know how to use a camera. You have David Hagerman. 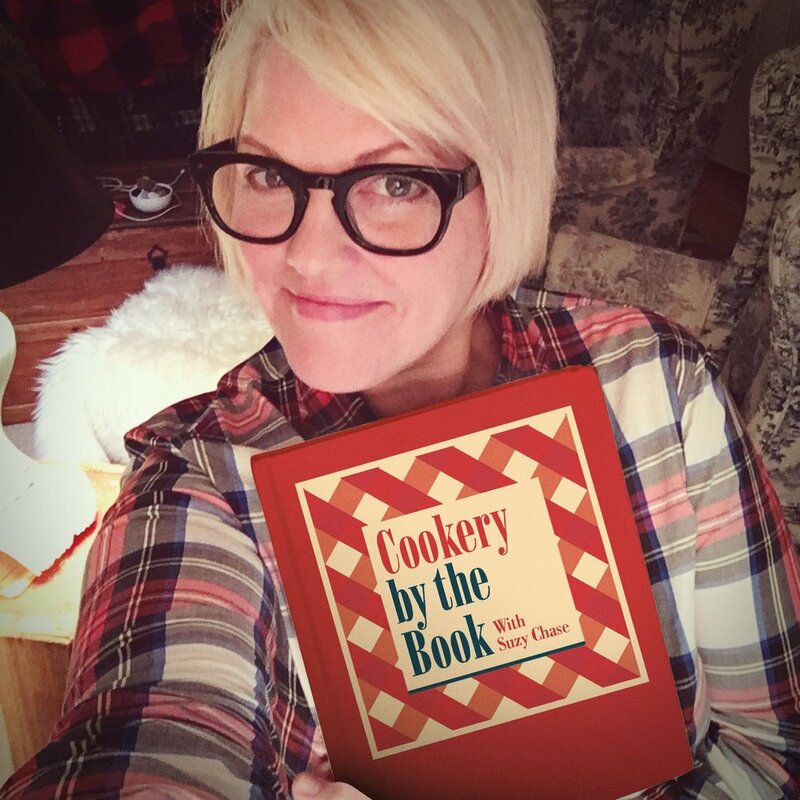 Suzy Chase: ... Cookery by the Book podcast. Robyn: Thanks for having on the show, Suzy.